As a college student, I interned with my U.S. Senator, an experience that provided an early glimpse into my future career working with lawmakers in two of the most regulated fields of healthcare and insurance. Back then my job was to clip newspaper articles and manage the phones. Today, interns manage Twitter feeds and email. While many of the functions and services we perform today in healthcare have evolved through technology and innovation, it is undeniable that many laws regulating these services have not. These outdated regulations need to be modernized to reflect not only the world we are living in today, but forward–looking to open the door for emerging technologies that will impact our not–so–distant future. As I work with regulators and industry leaders to educate them on how technology has changed the landscape, I can think of three areas that are most relevant today and how regulations are just barely keeping up. Newer technologies like telehealth, electronic medical records (EMR) and patient portals are opening doors and eliminating obstacles for patients who want more self–service capabilities. Injured at work? Many employers now provide private kiosks where workers can directly connect to a physician, pharmacist, or even a physical therapist. All of this can be done via kiosk or from the comfort of the injured worker’r;s home via mobile or desktop platforms. Medical care is available at the push of a button. As recently as two years ago, patients had to wait for an appointment to be seen by their physician and test results could take a week. Now patients can see MRI results online within a few hours of their appointment. Well–connected healthcare systems speed the delivery of care, shaving wait time from a week to as little as one day. Everyone benefits in this scenario: the injured worker and the employer, who both have a vested interest in early recovery and return to work. The sooner the patient is treated, the better the outcome. Despite the growing availability of this technology, telehealth – and more specifically, telemedicine – is not brand new; reportedly, telehealth has been in use as early as the 1960s. Yet the Centers for Medicare and Medicaid Services (CMS) updated its payment policies to recognize telehealth services in the late 1990s. And as of mid–2018, only a handful of workers’r; compensation regulations and fee schedules have officially been updated to recognize telemedicine – the clinical practice of medicine through remote means – as a reimbursable service. Yet attention to this technology is growing on the federal level. As of June 2018, more than 50 new pieces of telehealth–related legislation were introduced in Congress; of those, at least 10 bills would expand access to telehealth services for treatment of opioid use disorder. 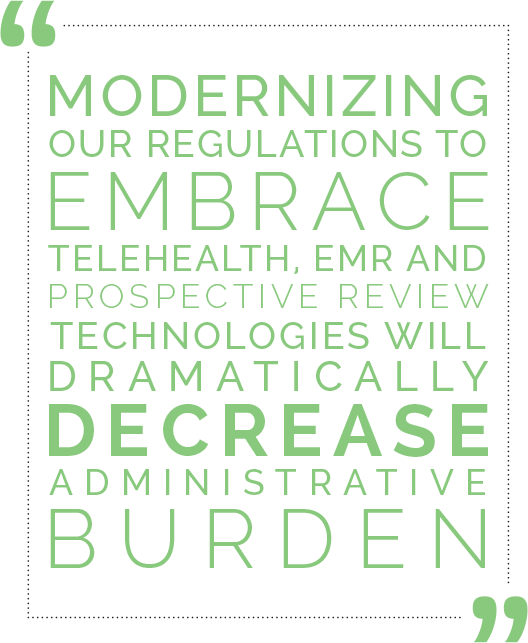 Modernizing our regulations to embrace concepts like telehealth, EMR, and prospective review technologies will not only help speed care and improve outcomes, it will dramatically decrease the administrative burden on all players. Elimination of multiple phone calls, paper faxes or worse, snail mail requests for service is not the future; it is here now. We have technologies in place that can connect providers, patients and insurers in a way that lawmakers never could have imagined years ago. State workers’r; compensation systems are acknowledging telehealth and even standardized electronic data exchange services like e–billing and electronic prospective review as a “thing”r; but have been slow to update regulations that embrace these technologies. As regulators are looked upon to eliminate barriers to care and face pressure from stakeholders to reduce the administrative burdens associated with outdated regulations that no longer deliver value, many states have formed advisory boards or ad–hoc groups to explore how to address new technologies. Earlier this year, the FDA issued a new policy that will enhance their ability to use electronic health record data to better evaluate the safety and effectiveness of medical products. This is just a recent example of how we can tap into the vast store of real–world data that already exists to facilitate true outcomes–based decision making. From a workers’r; comp standpoint, imagine a world where adjusters, nurse case managers and health care providers could access real– time records to not only see what services were completed, but to more completely understand the injured worker’r;s disability status and treatment plan. What if disability payments could be triggered from this type of data? It’r;s not so far away, considering patient portals are already accessible to the injured worker through many physician offices. What if there was an option to extend access to this data to third–party payers as a step towards increasing efficiencies in this area? Would new regulation be needed to do this, or could stakeholders undertake this voluntarily, similar to how Uber and Lyft transformed transportation, and worry about regulation afterwards? It is an interesting idea, and one that could speed the delivery and quality of care through better integration between all parties. One of the most difficult aspects of working in the regulatory affairs realm is convincing others to change the status quo. Many of the laws that regulate workers’r; compensation are over 20 years old, crafted at a time when lawmakers couldn’r;t contemplate the level of technological sophistication that is so prevalent today. Even our Baby Boomers, most of whom grew up without computers and cell phones, are using technology in ways we could not have predicted. The business of insurance has moved from a paper/phone/fax–centric delivery model to “online everything”r; in a relatively short timeframe. I have had the opportunity to help a few regulators better understand this as they journey towards adopting formularies, e–billing rules and other technology–driven efficiencies. It is up to all of us to help eliminate those inefficiencies created by outdated rules. This is a new era in workers’r; compensation and healthcare. Let’r;s all work to leave the door open for future technology’r;s impact on our world. Sandy Shtab, AVP of Advocacy & Compliance at Healthesystems, oversees the strategic development and execution of all regulatory advocacy efforts for the organization. 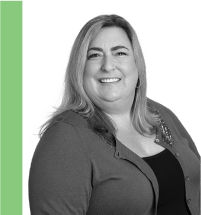 Ms. Shtab has expertise spanning 20 years in the insurance industry, working primarily in workers’r; compensation claims management, medical case management and compliance leadership roles. Her main areas of focus relate to PBM oversight and regulation, medical cost containment, and ensuring broad access to quality healthcare for injured workers across the country. She believes that proactive collaboration is the key to ensuring fair and balanced policy decisions that benefit all stakeholders. Currently, Ms. Shtab is an active appointee to the IAIABC Associate Member Council and the Medical Issues Committees where she has been recognized for her work towards educating regulators and others about regulatory and legislative policy impacting medical costs and injured worker outcomes. You can read more from Sandy Shtab in “State of the States”r; where she comments on regulatory activity across the country.